Greetings from your brothers and sisters in Christ here in Wotutu. We are doing better, even though some of us here are sick. Keep praying for the many who are sick. We do hope you are doing great and we keep you in all our prayers. Last week went on well with our studies in BVBIC-Wotutu. Students continue to grow both spiritually and physically. Keep praying for them. Weekend evangelism is going well and we continue to witness growth and love for the Lord and His church for the young congregation in Menji. Many continue to admire and love the New Testament way of worship, while others are like sister Dorothy are still under strong persecution from family. Keep her in your prayers. It is not easy for them. I sent one of our graduates there and he stays with brother John Nkemenkeng to help with the work over there. Keep evangelist Itoe David in your prayers as we will change them to help till we graduate a student in December of next year to go there permanently. Brother Mendel stood up in class to ask a question for clarifications and to gain more information. We love to see our students being eager to know more and to share their views on subject matter. This helps us keep them on tract as many who have been preaching to know now how to handle the truth. Evangelism is still going on, early in the morning and from house-to-house here in Wotutu. God continues to use our PA system to reach out to the communities every day in the morning, and we go by the nickname now in Wotutu: Church of Christ, the village clock, because we get up early and as we preach many also get up to prepare to go to their farms, businesses, and schools. This week, sister Linda Obie obeyed the gospel in the water pool of baptism. Some students, with brother Maurice stood by to watch her baptism. Keep her in your prayers. Her husband has been a Christian in Wotutu for the past two years. He was happy to see the wife obey the gospel and they have one focus now. We are serving a great God. 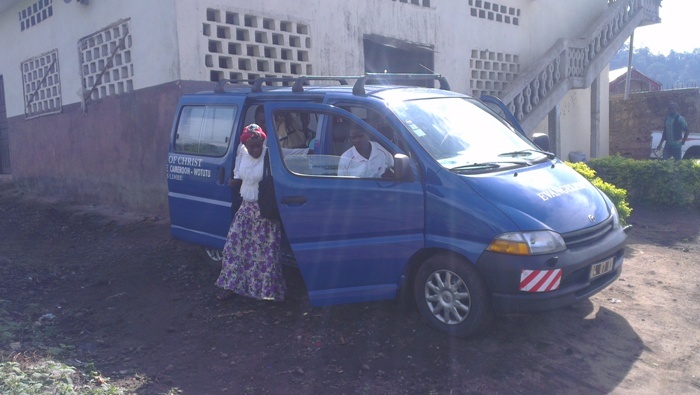 Today, after worship it was all joy and joy as we saw the long awaited van that was bought last November to enhance our evangelistic efforts. The students and the entire congregation shouted for joy as we prayed and thanked God for using all those He used to realize the dreams of this van. Only God will replenished it for them. 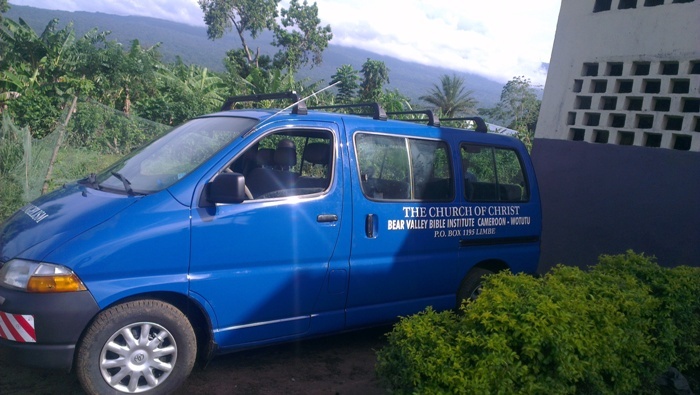 The van will carry our students around to evangelize. The van will also stand as a means of advertising for the church of Christ and the preaching school as we wrote on the wall of the van. The van will take 15 seats instead of the 19 seats we were intending to have. It seems the shipper sent to us this, but the good thing is that this one has four wheel drive. This morning, the car took some students to nearby congregations for worship and it equally carried some Christians from outside Wotutu who came down to worship with the congregation in Wotutu. To them, it is an answer to their prayers to have free transportation to worship at any time. We are still planning to go to Ideanau for evangelism and possibly start a new congregation on the west coast of Cameroon. God bless you and keep you strong. Thank you for standing by us. God bless you for sharing our newsletter with others. Keep doing it. God bless you and watch over you. Posted on April 26, 2015 by Robert Turner and tagged Extensions Cameroon.